This is from page 108 in the first edition of Biblical Hebrew: A Text and Workbook by Bonnie Kittel, Vicky Hoffer, and Rebecca Wright (page 122 in the 2nd). Do you see the problem here? There are at least two. The more obvious one is in the first example of the Hebrew relativizer supposedly functioning as the subject of a verb. Maybe it is and maybe it isn’t. I don’t know Hebrew. 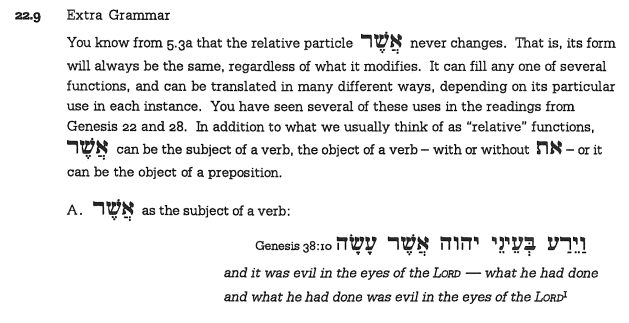 But what I do know is that if I assume the Hebrew is right and it is the subject of the verb, then the translation is wrong because there the relative pronoun is the object of the verb. But if the translation is right, then the example is wrong on both counts. That’s a Object, not a subject. The less obvious problem is with the statement, “In addition to what we usually think of as “relative” functions…” Just what do you usually think of as relative functions anyway? Can English relative not be Subjects, Objects, & Objects of prepositions? The man who read the book [subject], the book which the man read [object], the house in which I live [object of preposition]. Granted the last one is stilted and rather formal, but it’s still grammatical. Are these not ways we usually think of relative functions? Maybe I’m crazy and I’ve missed something big here that’s really obvious, but I just look at this and I shake my head. UPDATE: See comments — all of them. it was evil in the sight of the YHWH, what he did. That makes sense (that the whole relative clause is the subject). But even then, the description is still wrong, because she has explicitly said that the relativizer is the subject of the verb. Saying that the Hebrew relativizer is the Subject and saying that the relative clause is the subject are very different things. So it’s still a mistake, just slightly less outrageous. This is the kind of focus only on individual words to the neglect of phrases that is problematic in the vast majority of grammars — even one like Kittel’s that’s less traditional than most. Now I’ll go back to working on my vocabulary with Buth’s materials. Well I agree it’s definitely not the clearest bit of grammatical explanation I’ve ever read, but it has surprisingly generous Amazon reviews. “And he did evil in the eyes of the Lord, who acted.” (If the relative related to Lord, which it doesn’t). Or: “And he who acted did evil in the eyes of the Lord” (if the relative related to the internal subject of the first verb, which it doesn’t). Yeah. That’s a pretty glaring mistake, I gotta say. This seems a very strange analysis indeed. By your own admission, you don’t know Hebrew, yet you are questioning whether the Hebrew is correct. And if you don’t know Hebrew, how can you be in a position to question the translation? If you could understand Hebrew, you would understand more intuitively how “asher” is used in various contexts, rather than quibbling over semantic arguments in English. I nowhere questioned that the Hebrew was correct. You may want to go back and take a closer look. That would be a stupid thing for me to do even if I did know Hebrew (and I actually do know more Hebrew than this post lets on). What I did say was that the grammatical description is wrong. Read more closely next time.